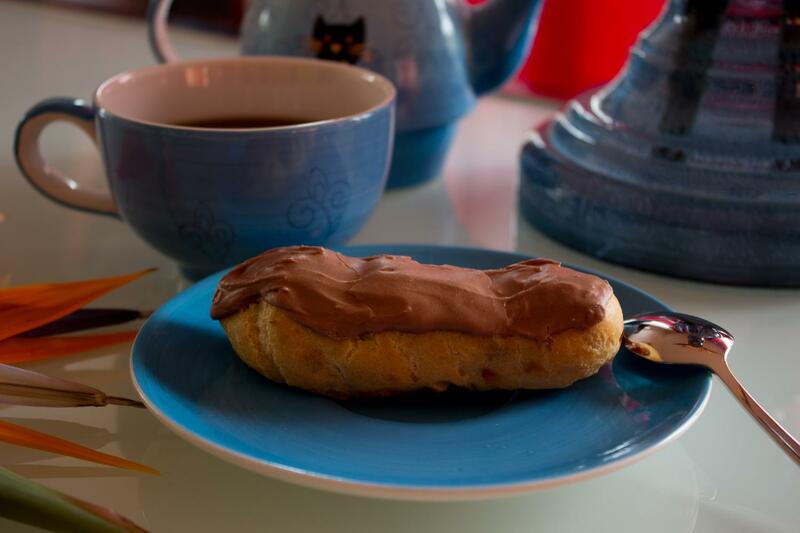 These delicious French chocolate eclairs are little traditional French pastries. When I was a child every sunday morning, I was buying some French pastries at the bakery with my mother, After lunch, we were usually laying in front of the TV savoring these tiny cakes! To bake these tiny cakes, you will have to first prepare a choux paste to bake the eclairs, then a chocolate pastry cream to fill in the eclairs and last but not least the chocolate topping. I strongly advise you to clean regularly your bowls and pastry bags in order to use again the same ones. In that way your kitchen will not look as if it was devastated by a huricane. Dice the butter. Add the water and the diced butter on a pan and bring to a boil. Quickly remove from the heat and add all the flour. Mix really quickly until you obtain a ball not gripping. Heat again with really low heat for a few seconds. Transfer to a bowl and add the first egg. Stir very quickly until you obtain again a paste. Do the same with the other eggs, one by one. Be careful to not have a paste too liquid because then the eclairs will not rise. When your choux paste is finished, preheat your oven to 200°C and place a greaseproof on a baking tray. Fill in your pastry bag with the choux paste and make your eclairs (approximately 2 cm large and 8 cm long). Place in the oven for 15 minutes and low the temperature to 180°C for 10 minutes. Remember to never open the oven during the baking! I always use my thermomix to make the French pastry cream, it is definitely easier for me. First dice the softened butter. Then to make 600 gr. of cream, I am mixing together at 90°C the flour, milk, white sugar, eggs and egg yolks as well as the seeded vanilla pod. In the meantime, melt the chocolate in a bain-marie. When you have done the French pastry cream, whisk until cold and add the melted chocolate and softened butter while you are whisking. Fill in your pastry bag and fill in the eclairs. If you want to have good looking ones, I suggest to fill them from the top at two or three different places. Then when you will add the topping, you will hide the holes at the same time. Melt the chocolate in a bain-marie. In the meantime, mix the white egg alone around one minute. Then add the powdered sugar and mix until you obtain a white paste. 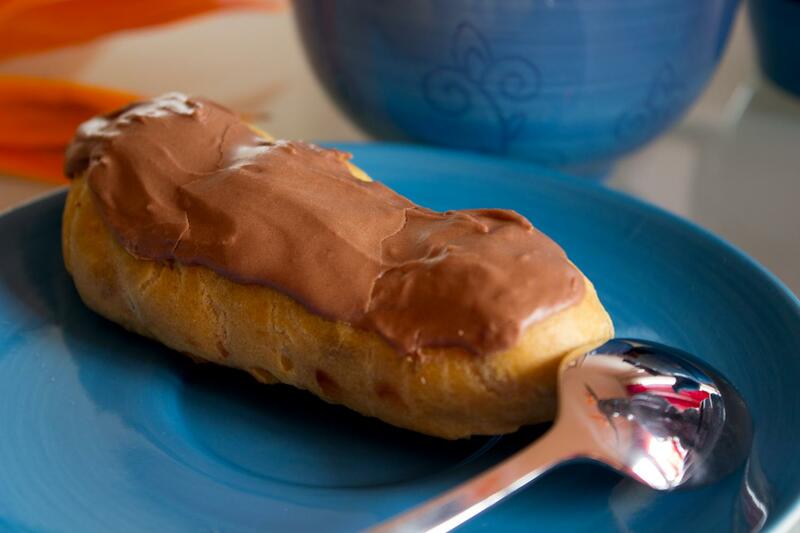 Now you can add the melted chocolate and decorate the top of your eclairs with it. Use your fingers to do it, you will get a better result. Now place in your fridge until your guests arrive! These classic French sweets are just delicious! I love éclairs… so thanks for the recipe! I love chocolate toppings.. and this looks so delicious and irresistible.. I wanna try one too! Thanks Lili. Was making a leek tart right now and thanks got my husband was there to help me clean.